Thom Atkins has finally graced us with a book about his wonderful bead embroidery, and what a book it is! Published by C&T Publishing, Beading Artistry for Quilts is full from start to finish with lushly exotic and emotionally evocative works like the one on the cover. You need to know right up front that this is not a project book, although it certainly gives you all the information and tools you'll need to create your own. Rather, it is a book full of inspirational overload and clear instructions on how Thom does what he does. Trust me, it well worth finding out! Thom uses a lot of pictorial elements from various fabrics and then enhances them with beads, but he also sometimes takes a piece of fabric and heavily beads it into whatever image he desires. 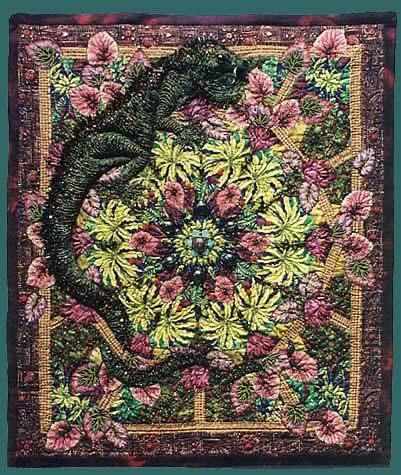 An example is his iguana in the quilt The Lotus Eater, 2003, shown above. There were several ideas that Thom shared that I found particularly helpful. He favors the Nymo thread that I also prefer, and he mentioned that with Nymo, unlike other threads, you should thread the end that you cut to prevent tangling (because of the twist in the thread). I never knew that! Another thing about Thom's style that really struck me was his "casual" approach to the frame area: he often has elements that flow over into the binding or frame area of his quilts and also likes to add fringe or other elements that stick right out of the frame. This gives some of his quilts a very dynamic feel. Beading Artistry for Quilts is primarily a visual feast. 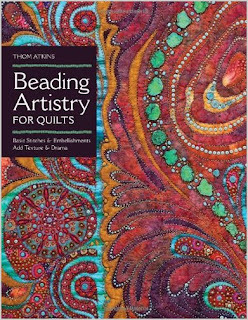 There are other books with more info on bead embroidery stitches and on quilting, but none that express so well the design sensibility of combining the two in the way that Thom does. You will not be disappointed.